There is no question that Evansville has had many good and dedicated police officers, and they are to be credited. But there was one black officer who became an Evansville legend and it is not out of reason to say that he was known from coast to coast. Anyone from anywhere who came to Evansville knew him or of him. He was just as kind as he was tough and he was tough in a fashion that made even those he reprimanded or arrested have the highest regard and respect for him. His name, Albert "Uncle Tom" Thompkins. 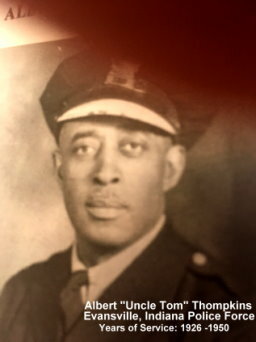 Uncle Tom joined the police force in 1926 and retired in 1950. After his retirement he went into the tavern business. His first business was located at the corner of Governor and Canal and his second was at the corner of Governor and Olive streets. How He Acquired The Nickname "Uncle Tom"
The normal interpretation of the name "Uncle Tom", is a black who is disloyal to blacks and loyal to whites, or one who caters to whites rather than blacks, one who runs to the white folks and tells everything he knows, one who caters to whites to further his own interests, one who would rather be around whites than blacks, one who tells whites all his business. These are some of the reasons why the name "Uncle Tom" was coined by blacks. It actually was taken from the book Uncle Tom's Cabin. This was not how Albert "Uncle Tom" Thompkins got his nickname. In fact, how it came about is in direct contrast. It happened at a downtown theatre while, as a youngster, Little Albert was watching the movie Uncle Tom's Cabin. During the scene which showed Simon Legree whipping the real Uncle Tom, a black man, Little Albert jumped out of his seat and yelled at the top of his voice, "Hit him back Uncle Tom". From that day until the day of his death, in April 1973, he was known as Uncle Tom. Albert Thompkins was born and grew up in Evansville. He went on the police department as a relatively young man. This was during the days of the rough and tough dives and joints throughout the notorious Baptistown area; the days when the beat walking cop, called flatfoot, had it rough. During the early years the rule was that blacks arrested blacks but no whites, whites arrested blacks and whites. This is one rule that Uncle Tom defied. Once he arrested a white man and was called into the chief's office. He knew why. Before the chief said a word, Uncle Tom laid his officers badge on the desk, turned and walked out. A few hours later a police officer came to his home and brought his badge back to him and he went back on the job. On another occasion, he arrested a white man and a colored woman, called the wagon and sent them to jail. He charged them with public indecency. The next morning he went to court to find the man had been turned loose and only the woman was standing trial. Uncle Tom asked where the other defendant was. The court clerk whispered to him that he was a family man with a reputable character and had been released. In dire disgust, Uncle Tom said aloud, "If that is the case, she is a family woman with a reputable character, so turn her loose." After making this statement he immediately walked out of the court room. They turned the woman loose since there was no officer to testify against her. It is common knowledge that Uncle Tom was a philanthropist in his own right. He was big hearted and helped the cause of the under-privileged, the aged, and the children. He financially supported anything that represented black progress, he welcomed black salesmen when he had his business and bought more from them than he really needed. He never refused a church which needed financial aid, his tavern was probably the only one where ministers walked right in without fear of being seen or misunderstood. They went in not only for a donation, they also enjoyed talking with him. He was very knowledgeable and an excellent conversationalist.